The Philippines and Qatar on Tuesday signed four bilateral agreements and one private sector agreement that would boost cooperation in the areas of investments, tourism, fisheries and the legal field. 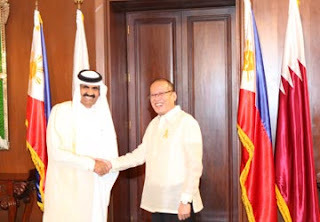 Philippine President Benigno Aquino III and the Emir of Qatar, His Highness Sheikh Hamad bin Khalifa Al Thani, who arrived in Manila for a two-day state visit, witnessed the signing of the agreements at the Palace Reception Hall after their bilateral meeting. The Department of Trade and Industry (DTI) and Qatar Holding Limited Liability Corporation signed an MOU on investment cooperation. 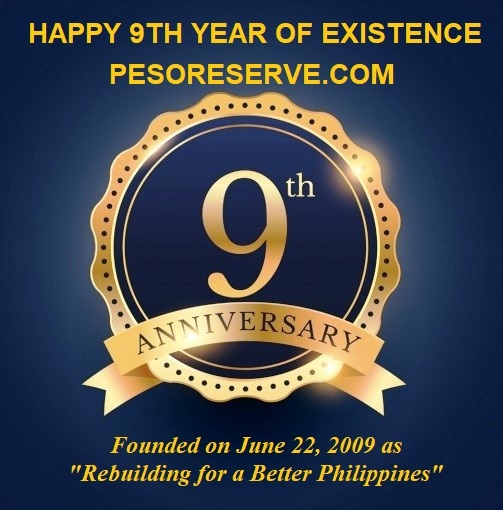 "This MOU would explore the investment opportunities in the Philippines in various sectors including natural resources, commodities, energy, agriculture, and infrastructure," Presidential Spokesman Edwin Lacierda said. The MOU on tourism cooperation is expected to create "favorable conditions for long-term cooperation in tourism for the mutual benefit of the Philippines and Qatar," Lacierda said. The MOU on agricultural and fisheries cooperation establishes the general framework for cooperation in the fields of agriculture and fisheries "for the purpose of fostering sectoral development and enhancing agri-related trade and investment," he added. It is the first-ever visit of the Emir of Qatar to the Philippines, who was feted to a state dinner in his honor at Rizal Hall of Malacanang, the presidential palace. The Emir will meet separately with Vice President Jejomar Binay and Speaker Feliciano Belmonte on Wednesday, before returning to Qatar. President Aquino and Emir Sheikh Hamad Bin Khalifa Al-Thani witnessed the signing of five agreements to enhance business relations between the Philippines and Qatar at Malacañang Palace. Presidential spokesman Edwin Lacierda said four government-to-government agreements were signed. One was the memorandum of understanding on tourism cooperation that would create favorable conditions for long-term cooperation in tourism for the mutual benefit of the Philippines and Qatar. Another MOU was on cooperation in the legal field that would encourage the sharing of experiences and best practices in the performance of the mandates of each country's ministry of justice. The MOU on agricultural and fisheries cooperation establishes the general framework for cooperation in the fields of agriculture and fisheries for the purpose of fostering sectoral development and enhancing agri-related trade and investment. Among the areas of cooperation are crops technology, vegetable and fruit preservation, biotechnology, post-harvest technology, livestock and fisheries, coastal and deep-sea fishing management, irrigation and water resources, and the halal industry. 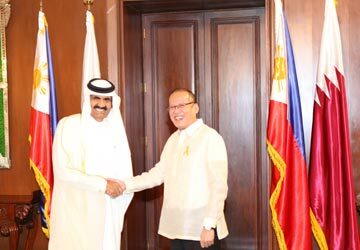 The Philippines will invite Qatar to participate in the country's Public-Private Partnership projects, Lacierda said. Qatar Airways will operate 14 flights weekly between Manila and Doha. Abdallah Okash, Qatar Airways Philippines country manager, corrected a STAR report last April 3 on the pullout of Qatar Airways of its thrice a week Cebu to Doha flights. "We have 14 weekly flights between Manila and Doha, and not twice a week," he said. Quoting aviation industry sources, The STAR reported the Qatar Airways decision to discontinue the Cebu to Doha flights was made due to high costs of operating in the country. The pullout of Qatar Airways of its Cebu-Doha flights came on the heels of the state visit of Sheik Hamad.